It's rare finding a rock that conforms to one's idea of the ideal heart-shaped rock to be painted. If there has been any rock more worthy of an adornment of glitter and paint, it would be the rock seen below. It was found washed ashore at Russian Gulch, where most of Your Spirit Rocks™ are collected. The symbol of the heart is unmistakable in most cultures throughout the world today. It can be seen almost anywhere. I don't know if it was the graphic artist Milton Glasser that came up with the "I ♥︎ NY" logo, but this became as popular as the smiley face 😀 popularized sometime in the 70's, and in movies like Forrest Gump. The heart symbolizes the best humanity has to offer each other. This is a symbol of altruism, empathy and goodwill. Hearts also denote a feeling a yearning and devotion for that which is loved. Unlike having a 'Heart of stone" which is the title of a song by the Rolling Stones. 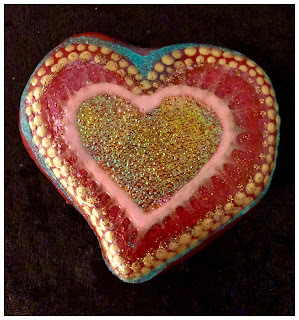 The heart of stone shown here is a gift, not a condition of forbearance. The Hearts of stone which I paint are keepsakes for those who treasure the love they have and want to keep in their life. These can be gifted and regifted. Passed on from one generation to the next. It also has to be said that the rock or its shape doesn't have to mean anything at all. This week's rock is called, "Solar flares" named for the intense summer heat we've been having here in Northern California. The idea that global warming is a myth dreamed up by scientists is preposterous. Global warming is real and our planet needs to wake up to that fact. Greenhouse gas notwithstanding, something has to be done to protect life as we know it. 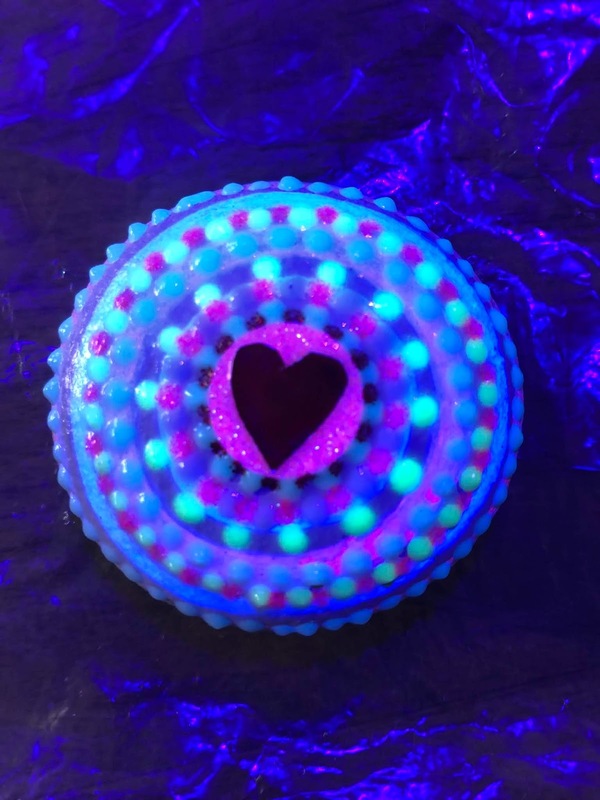 Below shows a "Sea Urchin" Rock (with a hologram heart) under a UV black light. It is just so much fun creating these items that bring such joy to those who purchase them. 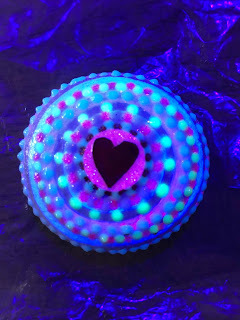 Black lights were not included in the gift bag up until recently, because they were hard to come by and expensive. Ace™ Hardware carried a flashlight model that was used to demonstrate what the rocks would look like, but unfortunately, I had to recommend that customers purchase them on their own. It is my intent to produce rocks that are "Illuminated", which fall in line with my description of each rock. 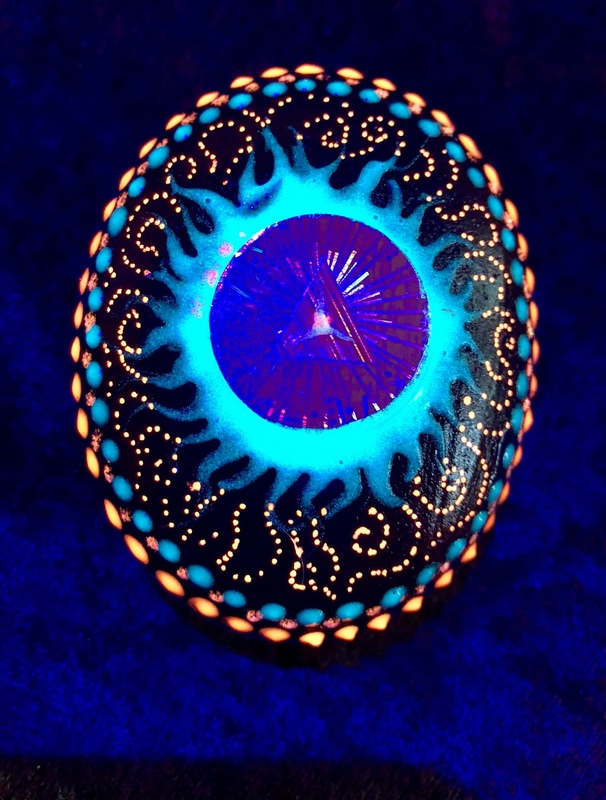 The rock below is a good example of what can expect to see when the lights are dimmed in the room and the UV light is focused on the rock itself. When it is said that, "Your rock will choose you if you are meant to have one" it is entirely plausible.The ongoing challenge is to assure that everyone gets a one-of-a-kind item they can relish for years to come.